Not only tight muscles or spinal disc problems are the reason for radiating back pain – a narrow vertebral canal, or spinal canal, also is a common cause. The spinal cord runs through the spinal canal along part of the spine. Narrowing (stenosis) of the canal can result in back pain, and pain when walking – a leisurely stroll in town, for example, is no longer possible and many stenosis patients find walking or even standing unbearable. The quality of life is often severely impacted and daily activities are restricted. 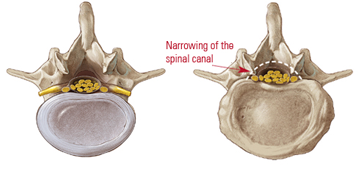 This condition is called spinal canal stenosis or vertebral canal stenosis. The spinal canal is a complex structure formed from vertebrae, vertebral bodies, intervertebral discs and ligaments, which principally serves as a protective tunnel for the spinal cord and also as a bony shield for the nerve roots exiting the spinal column. The nerve cord usually has sufficient room in the canal. If, however, the intervertebral discs, vertebrae or ligaments occupy too much space the nerves become compressed, or even jammed, which generally triggers strong pain. Narrowing occurs most frequently in the lumbar spine region – this is called lumbar spinal stenosis. Spinal stenosis leads to pain when compression is so advanced that the nerve roots or spinal cord is squeezed. Some people experience the characteristic symptom of leg pain, allowing them to walk only short distances. Because those affected must stop frequently – and are happy to take the opportunity to stop in front of shop windows – it is also known as the neurogenic “shop window syndrome”. It should, however, be distinguished from vascular claudication, which has very similar symptoms produced by circulatory problems in the legs. What causes a spinal stenosis? Often, several factors in combination lead to symptomatic spinal stenosis. First of all, genetic predisposition plays a role – the diameter of the spinal canal varies from person to person. Sometimes the spinal canal is narrow at birth with no reason known. Other congenital causes include a pronounced hollow back, malformation of the spine or spondylolisthesis. Most frequently, however, degeneration of the bone and cartilage components is the cause. Intervertebral discs become unstable with age; they lose density and the ability to bind water. As a result, the water content of the disc tissue reduces; the discs become flat, cracked and less stable. As the intervertebral discs lose height, the vertebral bodies come closer and closer together. The body does its best to keep them apart by forming bony outgrowths on the vertebrae and joints, a process which ultimately is the result of natural aging. The outgrowths take up space in the spinal canal and slowly there is further narrowing of space for the spinal cord. The ligament structures along the vertebral bodies also frequently thicken with age, which again contributes to space restrictions in the canal. To this extent, spinal stenosis is a phenomenon characteristic of the elderly. Typically, the disease occurs in persons older than 50 – there are estimates of approximately 2 to 10% of all older people being affected. Symptomatic spinal stenosis usually means a significant reduction in quality of life. Sufferers often have severe pain in the lower limbs that worsens when standing and walking. Pain is usually paired with numbness and in more severe cases, with a power loss in the legs. Sitting down usually brings quick relief, as well as a forward bent posture. Therefore, cycling is often possible, or other activities in which you can keep the bent position. When do I need surgery for my spinal stenosis? Few patients with spinal stenosis need surgery – most can be helped with conservative therapy such as physiotherapy. Only if symptoms are not getting any better after at least 3 months with these measures, surgery may be considered. The best results are achieved when individuals are struggling most with their neurological symptoms in the legs. If back pain is the prominent symptom, however, the operation often does not lead to the desired success. In recent years, very gentle, minimally invasive procedures have been developed.